Take off that mask and put on a feather boa! It breaks our hearts when we see people put on masks that hide their wild, crazy, beautifully deviant selves. We want to help, and so Unmask Yourself is our gift to you. It’s a 27-page PDF workbook packed full of our best tips, inspiration, and resources for expressing your authentic Self. It’s also an opportunity for you to see how we work, and to find out if our style of transformational teaching is a good fit for you. 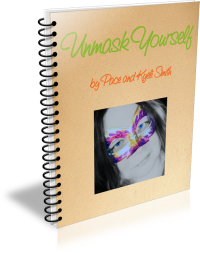 Just fill in this form, and you’ll receive Unmask Yourself immediately, plus you’ll get additional articles every week on living a wild, crazy, meaningful life. We promise not to share your email address with spammers, anyone who might be a spammer, anyone who has ever received a spam in their lifetime, or anyone else. And of course, you can unsubscribe at any time with no hassle.